Description Sepia photo from the estate of Blanche Jones,Jr. of Mulino, Oregon. 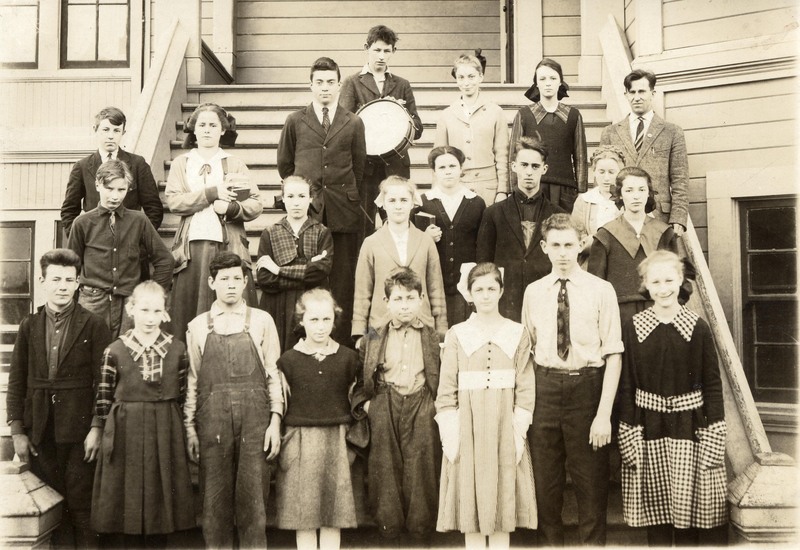 On loose paper: 1918 8th grade class. Ione King?, Iva Brandt, Ernest Schaubel, Alta Wirtz, Harry Johnson, Doris Miebush, Clark King, Delia Davis. Aileen Worthington, Harold Hoffman, Erma Schaebel, Mary [Wilson? ], Clarence Tapfer. Louis Worthington, Martha Smoke, Blanche (Bonnie) Jones, Ray O'Okeefe, drummer, Mr. McCoy, teacher. Physical Description H 3.5"" x W 5.5""